Do you believe this stat? Less than *THREE* percentage of CREs have access to real-time data capture from their building assets. We do – which is why we’ve partnered with Tridium Niagara to constantly work on helping property owners achieve operational efficiency and sustainability in real-time across their distributed portfolio of buildings. It’s also why we care about enabling the Niagara community to leverage their decades of automation experience to harness IoT and AI to optimise facilities. 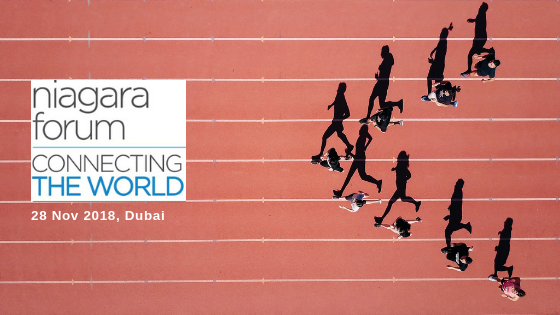 And that’s why I’m writing this post: to invite you to be a part of the Niagara Forum Dubai 2018 that’s shaping the future of technology in buildings NOW. This November, some of the world’s top automation leaders will be at the Niagara Forum bringing their tactical advice to discuss real-world uses of IoT in connected assets, integrated FM, and portfolio management. Here are the 3 hot topics you can watch out for at the event to bring back and apply to your own buildings and automation services. Traditionally, the building automation layer and the facility management layer have acted independent of each other that has consequently buried useful data and created expensive operational inefficiencies. Up until now, CREs and FMs have been put at a blind-spot and have relied on inefficient processes of juggling between tools and proprietary systems to firefight issues rather than proactively controlling operations from the driver’s seat. Now, the focus is shifting towards highly efficient operations and an elevated occupant experience. By clubbing together BAS with FM operations and workflows using software-led technology, buildings are able to leverage the existing BAS data gold mine, and use it to optimise operational efficiency and sustainability in real-time, translating into meaningful savings. Buildings require interoperability across their various automation components, and operating a portfolio of buildings require a holistic understanding of all available metrics in real-time to reach the next level of predictable intelligence; in aspects including building operations, asset and sustainability management, tenant engagement, occupant experience, and more. Take the example of Ford’s moving assembly line in the manufacture of cars. It not only revolutionised the industry but also greatly reduced costs and production time – bringing in centralised efficiency. Similar mechanics works in operating large portfolio of buildings. With the combined spend on facilities management and energy in buildings adds to a $2T market – any value that can be added to such economies of scale is enormous in potential. It holds true that for facilities optimisation to have better outcomes, it needs to be executed centrally combining all portfolio operations onto a central command hub. Different teams, different systems, different processes break the flow of efficiency and lead to failure. With Niagara Jace as an enabler to connect multi-vendor BAS/BMS centrally, a holistic real-time facilities optimisation solution like Facilio helps CREs and FMs benefit from multi-fold results without any downtime or uprooting any existing infrastructure. The amenity arms race is on in the CRE landscape and at this industry inflection point – it’s clear that there’s a disconnect between facility teams and what tenants really want. In a recently published closed group report (by Building Engines), figures show that while CREs dedicate more than 50% of their time in improving the tenant experience, only 25% of occupants agree to consistently receiving important communication from owners. Elevating buildings to meet the new demands of tenants means leveraging the ability of real-time data capture to deliver newer solution and services to optimise the occupant and workplace experience. The biggest gain in utilising technology to connect and centralise operational data from multiple systems is the ability to provide predictive models of equipment fault and downtime so that building owners will be able deliver a smooth tenant experience. We already see forward-thinking CREs enjoying tech-enabled opportunities as a competitive edge to enhance their facility offerings and provide flexible benefits that improves both the bottomline and the overall tenant experience. As a final thought – the IT/OT convergence in the built environment is at a tipping point. It’s happening NOW and there is a clear necessity to align and collaborate in the broader building IoT landscape. Successful implementation can help develop a robust ecosystem and that’s exactly what the Niagara Forum Dubai 2018 is all about – unlocking value creation in the next wave of buildings technology. Facilio is excited to build new relationship and make meaningful conversations with the leaders of the Niagara community. You can schedule a meeting with us right here.